Click locking mechanism ensures positive proof of sealing. 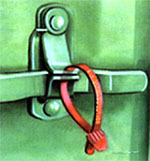 The unique head design gives an exceptionally high level of security with a low insertion force, resulting an ease of operation not experienced from other types of security seals. Tamper proof locking action cannot be pierced or sprung. A predetermined break point allows easy removal of the seal by hand. The thin sections in this area prevent the seal from being compromised by glues. The fixed length seals is marked "SEALED DO NOT REMOVE". The fixed length seal will fit all locking systems. User friendly, no sharp edges. No tool required to seal or open. Light weight, tough, corrosion resistant. (mm) To fit into Min. Red,Yellow, Blue, Green, Orange, Other Colours On Quantity Orders. Min.Qty. 1. Place the end of Seal through opening of container to be sealed. 2. Push the end of the seal into locking mechanism until Arrow is engaged. 3. Pull on seal to ensure Seal is locked.